The Centre for Sustainable Transportation at the University of Winnipeg has been working on a project called Kids on the move since 2002. This project looks at the links between land-use, transportation planning, health (both physical and mental), and young people. They provided their first report for the province of Ontario in 2005, and are working on a release a final report for BC very soon. I want to touch on some of the recommendation from the March 12, 2009 draft of the BC report. You can download a copy for the project’s website. Not surprisingly, the report concludes that land-use and transportation planning are linked at the hips. They point out the example of the disturbing trend of our sedentary lifestyle, and how low-density development plays an important role in the trend. It's not only schools that have been centralized. Small local stores have been replaced by stores in malls, usually at a greater distance from customers, or by larger stores serving a broader catchment area. Children, who might once have learned much from running er-rands to a local store, now find themselves accompanying parents on long shopping trips by car. Density may be the most important factor influencing car use, but there are others. How land uses are mixed can be important. If schools, workplaces, and stores are near resi-dences, the result may be that residents engage in more walking and bicycling, other things being equal. If uses are clustered into nodes, transit may be viable along connect-ing corridors, even though overall urban densities are low. According to the report some 20% of all trips are made by young people. This group is currently underrepresented to those people that make land-use and transportation planning decisions. As the graph shows, the higher the speed of traffic, the more likely the chance of death when a car hits a person. In fact, road traffic crashes are the leading cause of injury death in Canada for children over the age of one year. Besides that, poor air quality (major roads are a major cause of pollution) has a detrimental effect on young people's health and may be responsible for a host of chronic illness like asthma. In-car air quality is also a cause for concern. Now enough of the doom and gloom, the report makes some recommendations on what we can do to improve the urban environment for our young people. Not surprisingly when you improve the urban environment for young people you also make it more assessable for all people in our society like the physically challenged and our seniors. Guideline 1. In transport and land-use planning, the needs of children and youth should receive as much priority as the needs of people of other ages and the requirements of business. Guideline 3. As may be appropriate, establish or adapt one or more forums for children and youth to ensure that their perspectives are considered by land-use and transport planners. Guideline 4. Identify where children and youth want to go or need to go and, to the extent possible, provide ways of getting there by foot. Guideline 5. Assess pedestrian routes used or to be used by children and youth to ensure that they are as safe and suitable for them as possible. Guideline 6. Separate sidewalks used by children and youth from heavily trafficked roads, particularly where traffic moves slowly or vehicles are stationary with engines idling for long periods. Guideline 7. Ensure that sidewalks are always cleared of ice and snow. Guideline 8. For older children and youth, ensure that destinations that cannot be a walk away are no more than a bicycle ride away. Guideline 9. For younger children, ensure that sidewalks are suitable for their tricycles and bicycles. Guideline 10. For destinations to be reached by bicycle, provide separate bicycle paths or trails or, if not possible, install bicycle lanes on regular roads. Guideline 11. Ensure that bicycle riders are well provided for at intersections and have sufficient priority for forward movement. Guideline 12. At destinations, provide secure, convenient bicycle parking. Guideline 13. Ensure that every part of a transit system is safe and welcoming to young people, and affordable. Guideline 14. Avoid transfers by routing vehicles where children and youth want to and need to go; make transfers easy where necessary. Guideline 15. Examine every aspect of a transit system from the perspective of a parent with a child in a stroller, and make adjustments to meet such a traveller‘s needs. Guideline 16. Act to ensure that school policies and practices favour walking and cycling to and from school and other modes of active transport, or, where appropriate and possible, regular public transport. Guideline 17. For younger children, help arrange walking school buses and other means of supervision. Guideline 18. Act to reduce the time children spend in school buses to a maximum of no more than 40 minutes per day. Guideline 19. Where destinations cannot be reached by foot, bicycle or transit, arrange land uses so that in-car time is reduced. Guideline 20. Particularly in urban areas, post and enforce much lower speed limits. Guideline 21. 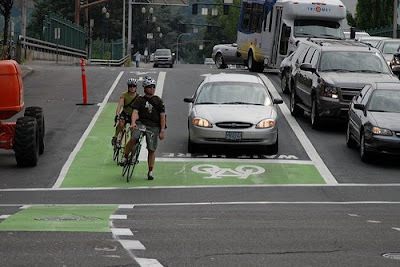 Do what is possible to reduce amounts of motorized road traffic generally and reduce its impacts. Anyway, check out the report and I’ll post an update when the final copy of the report is ready.